There are so many aspects of Japanese culture that I find absolutely fascinating; I could keep writing this blog for years! As with many countries around the world and throughout history, art is an intrinsic part of many traditional cultural phenomena in Japan. What I especially appreciate about the connection between the arts and Japanese cultural life (such as theater, dancing, and religion) is the emphasis on subtlety. This is particularly true of the time-honored form of theater called Nô (or Noh). Noh theater originated between the 8th and 14th centuries ce in Japan. It is possibly based on the Chinese form of satirical dance (gigaku in Japan) that involved silent, masked performances accompanied by music. The art form was originally performed in temples in Japan, but eventually became the favored art form of the nobility, samurai class, and shogunate. The present form evolved in the fourteenth century, which became highly symbolic plays that expressed the subjects of pain of loss, revenge, love of family, and honor. There is often a contrast between the physical and ghost world. Because the Noh involved evocative, esoteric subject matter, it was favored by the wealthy rather than the middle class. Noh theater presents slow, exaggerated movement, both dialogue and singing from the masked figures and the 6–8 member “chorus,” and bare stages that have a pine tree painted backdrop. This backdrop was in respect for the centuries old custom of holding Noh plays in temple grounds where the only stage setting was a large wooden platform in a park surrounded with pines. Much of the stark simplicity of Noh plays is reflective of the influence of Zen Buddhism, among which the tenets are serenity, simplicity, and spontaneity. 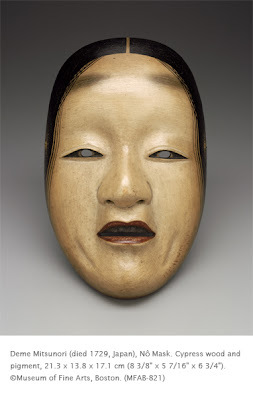 This mask is one of six types of female characters from Noh plays. As with Kabuki at the time, female roles were taken by men. The masks helped establish the character. There were several types of female masks. This is Shakumi, the strong, beautiful older woman. Shakumi is always distinguished by the stray strands of hair beginning after her crown. This mask might be meant to communicate sorrow at a dead loved-one or missing spouse, longing for a loved one, or regret at actions taken against a loved one. The mask presents the epitome of Japanese female beauty, much of which is actually based on depictions of the Buddha. Interestingly, the teeth are tarred, as gleaming white teeth were considered vulgar, and the eyebrows are shaved off and painted higher, a fashion that indicated the woman was to be considered intelligent. In the modern period, women as well as men take Noh roles. However, the plays presented are traditional. Many young Japanese actors have become famous for their portrayal of Noh dynasty characters. Noh masks are still made in the traditional manner, carved out of Japanese cypress wood. For me personally Noh is not really a kind of art I can clearly understand. But still, as I'm very much interested in the Japanese culture, I admit that Noh carries in it a bunch of philosophic ideas and beliefs that are incarnate in every Japanese person.